The U.S. Go Congress t-shirt modeled by Congress Director Chris Kirschner in our recent report (7/20 EJ) is actually the “Early Bird T-shirt” reports Congress Handbook Editor and t-shirt/logo designer Lee Anne Bowie. “The actual T-shirt for the Congress will have the design that appears on the website,” Bowie tells the EJ. 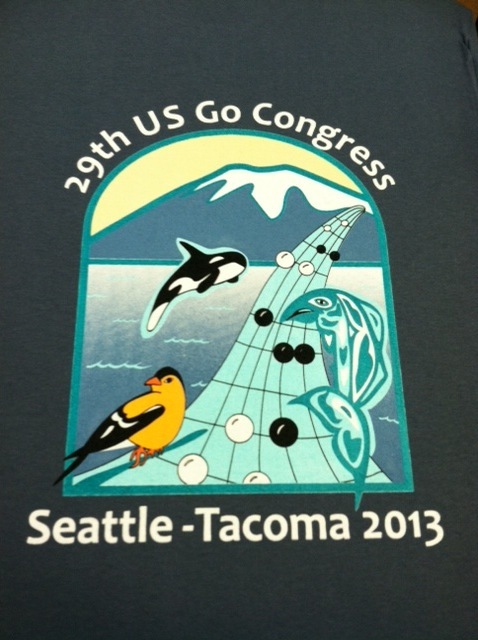 “Attendee’s t-shirts will look more like the photo at right if they selected the dark shirt.” The 2013 U.S. Go Congress is set for August 3-11 in Tacoma, WA.